Here’s an interesting situation: A government agency is responsible to make decisions that affect a specific community. However, the agency’s mandate is to serve the interests of the entire population (many of whom don’t care about what it does). Moreover, the agency’s governing Directors are appointed, not elected. How does this agency fulfill its broad mandate while being open and engaging both the directly affected community and broader constituency in what it does? That’s the challenge that confronts Canada’s Canada’s National Capital Commission (NCC). I was one of those people who thought that the NCC made decisions in private meetings behind closed doors. So, imagine my surprise when I saw a tweet telling me that the NCC would be Webcasting a public meeting of the NCC Directors. Not only was the decision-making process open for me to witness, but I could watch it directly from my desktop without the need to attend the actual meeting. A commonplace in this age, but totally outside of my expectations for the NCC. But it went further than that. One of the agenda items was a presentation by staff of the NCC’s Web 2.0 Strategy. So I watched. And as Daniel Feeny presented the Commission’s Web 2.0 strategy, I learned that the NCC had been integrating social media into its communications through a series of small pilot projects. They learned from each pilot, refining their approach and applying the lessons to the next pilot. A textbook example of an organization learning how to use social media – incrementally, iteratively, intelligently. So I’m delighted that Daniel Feeny, the NCC’s Director of Digital Communications, Outreach and Youth Programs, agreed to be the speaker at the next Third Tuesday Ottawa Social Media Meetup. Daniel will discuss what the NCC learned from its pilot approach, what he would tell other organizations exploring social media and what he sees in the future for the NCC and social media. If you’d like to attend, you can register at the Third Tuesday Ottawa Meetup site. 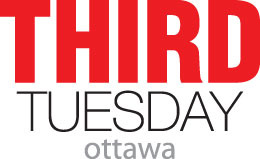 Finally, as always, I want to thank the Third Tuesday sponsors – CNW Group,Rogers Communications, Radian6 and Fairmont Hotels and Resorts. Their sponsorship for Third Tuesday makes it possible for us to bring great speakers not only to Toronto, but to Third Tuesdays across the country. Thank you CNW, Rogers, Radian6 and Fairmont for helping us to build a vibrant community of social media practitioners. We want students to be able to experience the best social media case studies and practices. So Thornley Fallis will refund the ticket price to any student who presents a valid student card to the registration desk at the event.